When you hear these and similar sayings it may appear that Christian faith is something we can choose, if we want. Or, on the other hand, not to choose, if we don’t want to. As if Christian faith is just some kind of a set of values, rituals and attitudes that one can decide to embrace if they seem to be appealing. How often we actually do present our faith to others this way? Trying to show how nice it is to be a Christian. How good are Christian values. How wonderful it is to be a part of a congregation. Literary trying to sell our faith to others. Come and try it! It’s so good. This definitely sets a certain pattern for our conversations with others. If Christian faith is something you have chosen, others may also decide to choose it, if you manage to persuade them that it’s worth it. But generally it sounds quite optional, and you can also decide to opt out, to choose something else. Especially when in our culture the Church in often associated with something obsolete and superstitious. Why would anyone make a decision to belong to her? We just heard how Jesus was talking about Christian faith with Nicodemus, a ruler of Jews. From what John wrote it seems, that Nicodemus also had similar ideas about what Christian faith is about. That’s why he was so perplexed listening to Jesus. 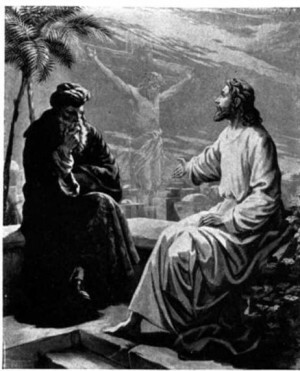 Today we’ll look at how Jesus Himself taught Nicodemus, explaining what is Christian faith and what it does. At the end we’ll look at what we are supposed to do having this faith. What is Christian faith, what it does, and what we are supposed to do. When we try to show others that Christian faith is something they also can choose, we just deceive and mislead them, and also ourselves. Really, that’s what we do. We ask them to do impossible, we expect them to do it, and we are disappointed when nothing happens. Jesus illustrated what Christian faith is with this wonderful analogy. “Truly, truly, I say to you, unless one is born again he cannot see the kingdom of God.” Unless one is born again, he cannot see the kingdom of God. Born again? What is Jesus saying? He is saying that to become a Christian can be likened to being born. That is quite vivid an illustration. It tells a lot about how much depends on us during our conversion to Christianity. Just think about your birth. Try to remember that time before you were born. When your future parents turned to you and asked: “Would you like to join our family? We are quite nice a couple, and you will greatly benefit from being born in our family.” What did you answer to their request? Do you remember this conversation? No? Of course, not. It is so obvious that we were not involved in decision making process regarding our future birth. We didn’t contribute to it in any possible way. We didn’t have such an option. Our life was given to us as a gift. As a gift of God and as a gift of our parents. We only received it, we didn’t chose it. The same way, as Jesus emphasized it, our faith is given to us as a gift, as the new life in Christ. Not as something we have chosen, but as something that has been given to us as God’s gift. Unless one is born of water and the Spirit… What does it remind you about? Water and the Spirit? Where do we have these two together? That’s right! At our Baptism. When we are baptized according Jesus command and when God’s word is spoken, we are baptized with water and the Holy Spirit. Then we receive this new life, this new identity, then we are born again as children of God. Sure, God can create Christian faith by His word also before the baptism, but in this conversation Jesus emphasised the baptism, for it shows how passive we are when Christian faith is given to us. It’s not our choice, it is God’s work, He gives us this new life, new identity. Of course, this new life, this faith has to be nourished. It doesn’t exist without proper food. That’s why Jesus commanded teaching everything that He has revealed us. When we listen to what God is teaching us, we are shaped for this new life, we grow in our understanding and wisdom, our faith is nourished and strengthened. Not by our actions, but by the word of God and the Holy Spirit. Our Christian faith is and remains a gift of God till our last hour. Besides, it is not simply a gift, it is very effective gift. So, our second question was – what does our faith do? What does it accomplish? As Jesus explains – our faith delivers us salvation: salvation from sin and death, and brings us into the kingdom of God to have eternal life in Jesus presence. Can we understand how it works? Can we explain it? We can talk about it, but it still remains a mystery. Jesus used one of the OT stories to explain how our faith works, namely the event with fiery snakes which attacked Israel’s camp, when they were rebelling against God and Moses. Amazing event. Who could come up with this kind of solution?! If you are bitten and about to die, look at this bronze snake and live. How could this be? How could this work? We have no idea. I admit it sounds unbelievable to our 21st century minds. But, what we know is – the Lord gave His promise that everyone who will look at bronze snake will live, and so it happened. It worked exactly as promised. Before hundreds and thousands of eyewitnesses. Those who trusted His promise, they lived. How is this possible? How does it work? You are baptized, you hear God’s promises, you receive the Holy Spirit, and you are saved from death and brought into eternal life. How does you faith do such a big things? You see, there are two elements in all these Biblical events. One is this visible reality. Everyone experienced what happened with these snakes. Those who trusted God’s promise, lived. It didn’t matter that they couldn’t explain how exactly God saved them. They still very much enjoyed the result. The same way we can look at Jesus promises. Events of His live, His death and resurrection give credibility to His words. We don’t put our trust on Him only because He said something that is quite incomprehensible. No! We trust Him wholeheartedly because He demonstrated that, indeed, all authority in heaven and on earth is given to Him. Whatever He said, happen. Whatever He command, came to fulfilment. We are witnesses of God’s works among us. What we have received and what we share, these are testimonies of eyewitnesses. The NT consists of eyewitness testimonies. If Jesus says that by trusting Him, Christ Crucified, by being baptized we are born again and will receive eternal life, there is no reason to doubt His words. Even if we can’t explain how exactly God does what He does. Nevertheless we can experience it. When we are born from the Spirit, we can begin to enjoy this new life. This life in new relationships. Totally different life. You see, people may think that they can understand what Christian faith is just by observing what Christians do, how Christians live, etc. As if Christian faith is some kind of social phenomenon. Observe, and you get it. No, far from it. Just think for a while, – how can you get to know other people? If you just observe them? Sure, you can learn a lot from observations, but you can’t get to know person in this way. You need to engage in conversation, when ones character and attitude towards you is revealed in words. This is what happens when Christian faith is given to you. You are embraced in relationships with the Father and the Son and the Holy Spirit. He speaks to you, He reveals what His attitude is. He comes to you to listen to your prayers and to bless you in the Divine Service. He reveals Himself, and you can open to Him your heart without fear, as to your gracious and loving Father. Then you can truly know God, knowing in a sense of realizing what kind of incredibly beautiful person He is, how self-sacrificially He has acted for your benefit, how much He still daily does for you, and what He has prepared for you in age to come. This is what Christian faith is and does. It is about communion with God, Christian faith brings you into relationships with true God, where He reveals Himself and blesses you in so many ways. Now we arrive to our last question. When we are made children of God, when we have receive this precious gift of Christian faith, what should we do? How do we respond to God’s grace? By sharing it with others. By bringing the Good News about what God has done in Jesus to all people. How do we do it? There are few things we need to remember. It is not our job to make someone a Christian. Only God Himself can do it by His word and the Spirit. Our responsibility is to deliver His message. To tell others the truth about our situation. We all are broken creatures, sinners, rebellious against true God. It doesn’t matter what we think about ourselves. It doesn’t change God’s evaluation. This is the message we need to share. It is the power of God for our salvation. These are the most important news ever shared. You are sent to deliver them. That’s an incredible honour. It is not an easy message, though, it’s quite a challenging one. For those who are not yet born again, this message sounds like foolishness. Therefore we should be humble bringing this message, but not humiliated – for we need to realize that with this Gospel we bring to people new birth, salvation and eternal life. We should be proud, but not arrogant, for this is not our message, this is not our gift to them, we are only messengers, servants of the Lord Almighty. Let’s pray that the Holy Spirit Himself would guide our efforts, and that the word of God that we proclaim and share would not return empty, but bear much fruit, bringing many brothers and sisters into God’s eternal kingdom.